No. 43, Jalan Selat Selatan 22, Taman Kem Industrial Park, 42000 Port Klang, Selangor, Malaysia. 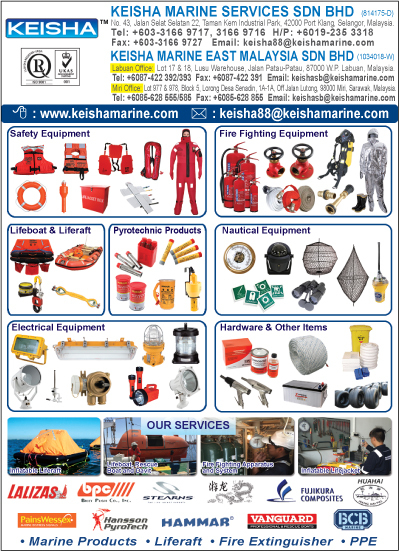 Keisha Marine Services Sdn Bhd (KMS) is a leading Malaysa safety equipment supplier and Malaysia Personal Protective Equipment (PPE) company providing marine equipment, spare parts, life saving equipment, chemical products, eletrical products, life rafts and fire fighting equipment servicing. We can supply to ships of every kind in the marine industry. 1. Realiability and fulfillment rates are the most important pillars in which we have built our business. 2. We offer our realiability at a very fair price to all our customers. We will fullfill our orders as fully and accurately as possible because ample products are stocked for immediate supply. All the products that KMS supply meet the requirement of International Maritime Organization (IMO) by complying with Safety of Life at Sea (SOLAS) standard. 3. We have build our reputation for satisfying even the most unusual and urgent needs, so virtually no demand is beyond fufillment. 4. We have a life raft center to cater to our customers when they need to service their life rafts. We also provide fire fighting equipment services to our customers. Our life raft service is certified by Malaysia Marine Deparment, Lloyd's and B.V.
Our company's main objective is to earn the position as your preferred and reliable one-stop supplier and problem solver. We can achieve this by providing better services at an increasing number of locations within Malaysia. Our commercial success is based on our ability to work hand-in-hand with you as our customer and in deserving your confidence, your trust and your loyalty. 1. We are 24 hours a day, 7 days in a week in operation. 2. We have fully equipped life raft service station working around the clock, ready for inspection, repair or testing of your life raft. Feel safe that your life raft is operational when you need them most. 3. We can be reached by phone, email and fax. 4. Efficient and well maintained transport fleet. 5. We stock the products most needed for your vessels. We will maintain a database of previous provisioning so that we can serve you better and faster.